At the beginning of this our pontificate,--which, not for any merits of our own, but of its own great goodness, the providence of Almighty God hath committed unto us,--already perceiving unto what troubled times, and unto how many embarrassments in almost all our affairs, our pastoral solicitude and watchfulness were called; we would fain indeed have remedied the evils wherewith the Christian commonwealth had been long afflicted, and well-nigh overwhelmed; but we too, as men compassed with infirmity, felt our strength unequal to take upon us so heavy a burthen. For, whereas we saw that peace was needful to free and preserve the commonwealth from the many impending dangers, we found all replete with enmities and dissensions; and, above all, the (two) princes, to whom God has entrusted well-nigh the whole direction of events, at enmity with each other. Whereas we deemed it necessary that there should be one fold and one shepherd, for the Lord's flock in order to maintain the Christian religion in its integrity, and to confirm within us the hope of heavenly things; the unity of the Christian name was rent and well-nigh torn asunder by schisms, dissensions, heresies. Whereas we could have wished to see the commonwealth safe and guarded against the arms and insidious designs of the Infidels, yet, through our transgressions and the guilt of us all,--the wrath of God assuredly hanging over our sins,--Rhodes had been lost; Hungary ravaged; war both by land and sea had been contemplated and planned against Italy, Austria, and Illyria; whilst our impious and ruthless enemy the Turk was never at rest, and looked upon our mutual enmities and dissensions as his fitting opportunity for carrying out his designs with success. Wherefore, having been, as we have said, called upon to guide and govern the bark of Peter, in so great a tempest, and in the midst of so violent an agitation of the waves of heresies, dissensions, and wars; and, not relying sufficiently on our own strength, we, first of all, cast our cares upon the Lord, that He might sustain us, and furnish our soul with firmness and strength, our understanding with prudence and wisdom. 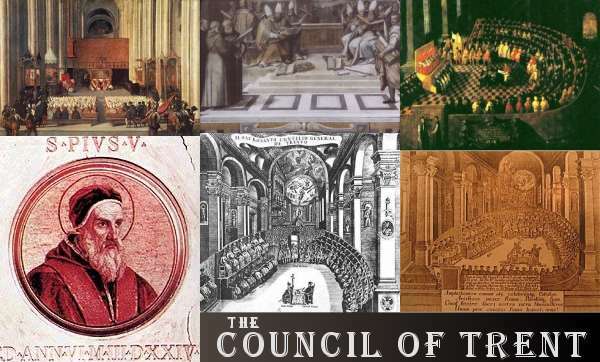 Then, recalling to mind that our predecessors, men endowed with admirable wisdom and sanctity, had often, in the extremest perils of the Christian commonwealth, had recourse to ecumenical councils and general assemblies of bishops, as the best and most opportune remedy, we also fixed our mind on holding a general council; and having consulted the opinions of those princes whose consent seemed to us to be specially useful and opportune for this our project; when we found them, at that time, not averse from so holy a work, we, as our letters and records attest, indicted an ecumenical council, and a general assembly of those bishops and other Fathers whose duty it is to assist thereat, to be opened at the city of Mantua, on the tenth of the calends of June, in the year 1537 of our Lord's Incarnation, and the third of our pontificate; having an almost assured hope that, when assembled there in the name of the Lord, He, as He promised, would be in the midst of us, and, in His goodness and mercy, easily dispel, by the breath of His mouth, all the storms and dangers of the times. But,--as the enemy of mankind ever sets his snares against holy enterprises, --at the very outset, contrary to all our hopes and expectations, the city of Mantua was refused us, unless we would submit to certain conditions,--as described in other letters of ours,--which conditions were utterly alien to the institutes of our predecessors, to the state of the times, to our own dignity and liberty, that of this holy see, and of the ecclesiastical character. We were, therefore, necessitated to find another place, and to make choice of some other city ; andwhereas one fit and suitable did not immediately present itself, we were obliged to prorogue the celebration of the council unto the ensuing calends of November. Meanwhile the Turk, our cruel and perpetual enemy, attacked Italy with a vast fleet; took, sacked, ravaged several cities of Apulia, and carried off numbers into captivity; whilst we, in the midst of the greatest alarm, and the general danger, were engaged in fortifying our shores, and in furnishing assistance to the neighbouring states. But not therefore did we meanwhile cease to consult with the Christian princes, and to exhort them to inform us, what, in their opinion, would be a suitable place wherein to hold the council: and whereas their opinions were various and wavering, and there seemed to be needless delay, we, with the best intentions, and, as we also think, with the most judicious prudence, fixed on Vicenza, a wealthy city granted to us by the Venetians, and which, by their valour, authority, and power, offered in a special manner both unobstructed access, and a safe and free place of residence for all. But, as too much of the time appointed had already passed away; and it was necessary to signify to all the fresh city that had been chosen; and, whereas the approaching calends of November precluded our having the opportunity of making the announcement of this change public, and winter was now near; we were again constrained to defer, by another prorogation, the time for opening the Council, to the next ensuing Spring, that is, to the next calends of May. This having been firmly resolved upon and decreed; considering,--whilst preparing ourselves, and arranging all other matters for conducting and celebrating that assembly in a proper manner under the divine assistance,--that it was a point of great importance, both as regards the celebration of the Council, and the general weal of Christendom, that the Christian princes should be united together in peace and concord; We ceased not to implore and conjure our most beloved sons in Christ, Charles, ever August, the emperor of the Romans, and Francis, the most Christian king, the two main supports and stays of the Christian name, to meet together for a conference between them and us; and, with both of them, by letters, Nuncios, and our Legates a latere selected from amongst our venerable brethren, did we very often strive to move them to lay aside their jealousies and animosities; to unite in strict alliance and holy friendship; and to succour the tottering cause of Christendom: for as it was to preserve this especially, that God had bestowed on them their power, if they neglected to do this, and directed not all their counsels to the common weal of Christians, a bitter and severe account would they have to render unto Him. They, yielding at last to our prayers, repaired to Nice; whither we also, for the cause of God and to bring about peace, undertook a long journey, though sorely unsuited to our advanced age. Meanwhile, as the time fixed for the Council,--the calends to wit of May,--drew nigh, we did not neglect to send to Vicenza three Legates a latere,--men of the greatest virtue and authority, chosen from the number of our own brethren, the cardinals of the holy Roman Church,--to open the Council; to receive the prelates as they arrived from various parts; and to transact and attend to such matters as they should deem necessary, until we, on our return from our journey and message of peace, should be able ourselves to direct everything with greater precision. We, in the mean time, applied ourselves to that holy and most necessary work, the negotiation of peace; and this with all the zeal, the affection, and the earnestness of our soul. 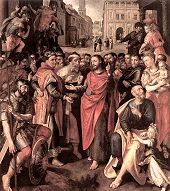 God is our witness, on whose clemency we relied, when we exposed ourselves to the dangers of that journey at the peril of our life: our conscience is our witness, which herein, at least, cannot reproach us with having either neglected, or not sought for, an opportunity of effecting a reconciliation: the princes themselves are our witnesses, whom we so often and so earnestly conjured by our Nuncios, letters, legates, admonitions, exhortations, and by all kinds of entreaties, to lay aside their jealousies, to unite in alliance, and with combined zeal and forces to succour the Christian commonwealth, which was now reduced to the greatest and most urgent danger. And witnesses too are those watchings and cares, those labours of our soul both by day and night, and those grievous solicitudes, which we have already endured to such an extent in this business and cause; and yet our councils and acts have not as yet brought about the wished-for result. For so hath it seemed good to the Lord our God, who, however, we still hope will cast a more favourable eye on our wishes. For ourselves, we, as far as in us lay, have not, indeed, herein omitted anything that was due from our pastoral office. And if there be any who interpret in any other sense our endeavours after peace, we are indeed grieved; but, in our grief, we return thanks to that Almighty God, who, as a pattern and a lesson of patience unto us, willed that His own apostles should be accounted worthy to suffer reproach for the name of Jesus who is our peace. However, in that our meeting and conference at Nice, though, by reason of our sins, a true and lasting peace could not be concluded between the two princes, yet was a truce for ten years agreed upon; under favour of which having our hopes, that both the sacred council might be celebrated more commodiously, and further that peace might be perfectly established by the authority of the council, we were urgent with those princes to come themselves to the council, to bring with them those of their prelates who accompanied them, and to summon the absent. They having excused themselves upon both these points,--for that it was at that time, necessary for them to return to their kingdoms, and that the prelates whom they had with them, being wearied and exhausted by the journey and its expenses, must needs refresh and recruit themselves,--exhorted us to decree yet another prorogation of the time for opening the council. And whereas we had some difficulty to yield herein, in the interim we received letters from our legates at Vicenza, announcing that, although the day for opening the council had arrived, nay had long since passed by, barely one or two prelates had repaired to Vicenza from any of the foreign nations. Upon receiving this information, seeing that the council could not, under any circumstances, be held at that time, we accorded to the said princes, that the time for celebrating the council should be deferred till next holy Easter, the feast of the Resurrection of the Lord. Of which our ordinance and prorogation, the decretal letters were given and published at Genoa, in the year of the Incarnation of our Lord, MDXXXVIII, on the fourth of the calends of July. And this delay we granted the more readily, because each of the princes promised us to send an ambassador to us at Rome; in order that those things which were necessary for the perfect re-establishment of peace,--all of which could not, on account of the shortness of the time, be completed at Nice,--might be treated of and negotiated more conveniently at Rome in our presence. And for this reason also, they both begged of us, that the negotiation of peace might precede the celebration of the council; for that, peace once established, the council itself would then be much more useful and salutary to the Christian commonweal. It was, indeed, this hope of peace, thus held out to us, that ever moved us to assent to the wishes of those princes; a hope which was greatly increased by the kindly and friendly interview between those two princes after our departure from Nice; the news of which was to us a source of very great joy, and so confirmed us in our good hope, that we believed that God, at length, had hearkened to our prayers, and had graciously received our earnest wishes for peace. The conclusion, then, of this peace was both desired and urged; and as it was the opinion not only of the two princes aforenamed, but also of our most dear son in Christ, Ferdinand, King of the Romans, that the business of the council ought not to be entered upon until after peace had been established; whilst all the parties urged upon us, by letters and their ambassadors, again to appoint a further prorogation of the time; and the most serene emperor was especially urgent, representing that he had promised those who dissent from Catholic unity, that he would interpose his mediation with us, to the end that some plan of concord might be devised, which could not be accomplished satisfactorily before his return to Germany: impelled throughout by the same desire of peace, and by the wishes of so mighty princes, and, above all, seeing that not even on the said feast of the Resurrection had any other prelates assembled at Vicenza, we, now avoiding the word prorogation, so often repeated in vain, chose rather to suspend the celebration of the general council during our own good pleasure, and that of the Apostolic See. We accordingly did so, and despatched our letters touching such suspension to each of the above-named princes, on the tenth day of June, MDXXXIX, as from the tenor thereof may be clearly seen. This necessary suspension, then, having been made by us, whilst we were looking forward to that more suitable time, and to that conclusion of peace which was later to bring both dignity and numbers to the council, and more immediate safety to the Christian commonweal; the affairs of Christendom meanwhile fell day by day into a worse state. The Hungarians, upon the death of their king, had invited the Turk; King Ferdinand had declared war against them; a part of Belgium had been incited to revolt against the most serene emperor, who, to crush that rebellion, traversed France on the most friendly and harmonious terms with the most Christian king, and with great show of mutual good will towards each other; and, having reached Belgium, thence passed into Germany, where he commenced holding diets of the princes and cities of Germany, with the view of treating of that concord of which he had spoken to us. But as there was now no longer scarcely any hope of peace, and the scheme of procuring and treating of a re-union in those diets seemed only adapted to excite greater discord, we were led to revert to our former remedy, a general council; and, by our legates, cardinals of the holy Roman Church, we proposed this to the emperor himself; and this we did especially and finally in the diet of Ratisbon, at which our beloved son, Cardinal Gaspar Contarini, of the title of St. Praxedes, acted as our legate with very great learning and integrity. For, whereas what we had previously feared now come to pass,--that by the advice of that diet we were called upon to declare that certain of the articles, maintained by the dissenters from the Church, were to be tolerated until they should be examined and decided upon by an ecumenical council; and whereas neither Christian and Catholic truth, nor our own dignity and that of the Apostolic See, would suffer us to yield this,---we chose rather to command that a proposal should be openly made, that a council should be held as soon as possible. Nor, indeed, had we ever any other sentiment or wish, but that an ecumenical and general council should be convened on the very first opportunity. For we hoped that both peace might thereby be restored to the Christian people, and to the Christian religion its integrity; yet were we wishful to hold that council with the good wishes and favour of the Christian princes. And whilst looking forward to those good wishes, whilst watching for that hidden time, for the time of thy good pleasure, 0 God, we were at last forced to the conclusion, that every time is well pleasing unto God wherein deliberations are entered upon touching holy things, and such as relate to Christian piety. Wherefore, upon beholding with the bitterest grief of soul, that the affairs of Christendom were daily hurrying on to a worse state; Hungary overwhelmed by the Turk; Germany endangered; all the other states oppressed with terror and affliction; we resolved to wait no longer for the consent of any prince, but to look solely to the will of God, and the good of the Christian commonweal. Accordingly, as we no longer had the city of Vicenza, and were desirous, in our choice of a fresh place for holding the council, to have regard both to the common welfare of Christians, and also to the troubles of the German nation; and seeing, upon several places being proposed, that they (the Germans) wished for the city of Trent, we,---though of opinion that every thing might be transacted more commodiously in Cisalpine Italy,---nevertheless yielded up our will, with paternal charity, to their demands. Accordingly, we have chosen the city of Trent as that wherein an ecumenical council is to be held on the ensuing calends of November : fixing upon that place as a convenient one whereat the bishops and prelates can assemble very easily indeed from Germany, and from the other nations bordering on Germany, and without difficulty from France, Spain, and the other remoter provinces. And in fixing the day for the council, we have had regard that there should be time both for publishing this our decree throughout the Christian nations, and for allowing all prelates an opportunity of repairing to Trent. Our motive for not prescribing that a whole year should expire before changing the place of the council,--as by certain constitutions has been aforetime regulated,---was this, that we were unwilling that our hope should be any longer delayed of applying some remedy to the Christian commonwealth, suffering as it is under so many disasters and calamities. And yet we observe the times; we acknowledge the difficulties. We know that what may be looked for from our councils is a matter of uncertainty. But, seeing that it is written, commit thy way to the Lord, and trust in him, and he will do it, we have resolved rather to trust in the clemency and mercy of God, than to distrust our own weakness. For, upon engaging in good works, it often happens, that what human councils fail in, the divine power accomplishes. Wherefore, relying and resting on the authority of that Almighty God, Father, and Son, and Holy Ghost, and on the authority of His blessed apostles, Peter and Paul, (an authority) which we also exercise on earth; with the advice also and assent of our venerable brethren, the cardinals of the holy Roman Church; after having removed and annulled, as by these presents we do remove and annul, the suspension aforenamed, we indict, announce, convoke, appoint, and decree a sacred, ecumenical and general council,--to be opened on the ensuing calends of November of the present year, MDXLII, from the Incarnation of the Lord,--in the city of Trent, a place commodious, free, and convenient for all nations; and to be there prosecuted, concluded, and completed, with God's help, to His glory and praise, and the welfare of the whole Christian people; requiring, exhorting, admonishing all, of every country, as well our venerable brethren the patriarchs, archbishops, bishops, and our beloved sons the abbots, as also all others soever, unto whom, by right or privilege, the power has been granted of sitting in general councils, and of delivering their sentiments therein; enjoining moreover, and strictly commanding them, by virtue of the oath which they have taken to us and to this holy See, and in virtue of holy obedience, and under the other pains, which, by law or custom, are usually passed and proposed in the celebration of councils, against those who do not attend, that they are, undoubtedly to repair to and to be present themselves in person at this sacred council--unless they shall happen to be hindered by some just impediment, of which, however, they shall be obliged to furnish proof--or at all events by their own lawful deputies and proctors. And we also beseech the aforenamed emperor, and the most Christian king, as also the other kings, dukes, and princes, whose presence, now if ever, would be of especial advantage to the most holy faith of Christ, and of all Christians; conjuring them by the bowels of the mercy of God and of our Lord Jesus Christ,--the truth of whose faith, and whose religion are now so sorely assailed both from within and without,--that, if they would have the Christian commonweal safe, if they feel themselves bound and obliged, by the Lord's great benefits towards them, they abandon not His own cause and interests; and come themselves to the celebration of the sacred council, where their piety and virtue would be greatly conducive to the common good, to their own welfare, and that of others, both in time and eternity. But if, which we hope may not be the case, they shall be unable to come in person, let them at least send, with an authoritative commission, as their ambassadors, men of weight, who may each in the council represent the person of his prince with prudence and dignity. But above all, let this--which is a thing very easy on their parts--be their care, that, from their respective kingdoms and provinces, the bishops and prelates set forth without tergiversation and delay; a request which God Himself, and we, have a right to obtain from the prelates and princes of Germany in a special manner; for as it is principally on their account, and at their instance, that the council has been indicted and convoked, and in the very city which they desired, let them not think it burthensome to celebrate and adorn it with the presence of their whole body. That thus,--with God going before us in our deliberations, and holding before our minds the light of His own wisdom and truth,--we may, in the said sacred ecumenical council, in a better and more com-modious manner, treat of, and, with the charity of all conspiring to one end, deliberate and discuss, execute and bring to the desired issue, speedily and happily, whatsoever appertains to the integrity and truth of the Christian religion; the restoration of good and the correction of evil manners; the peace, unity, and concord both of Christian princes and peoples; and whatsoever is needful for repelling those assaults of barbarians and infidels, with which they seek the overthrow of all Christendom. And that this our letter, and the contents thereof, may come to the knowledge of all whom it concerns, and that no one may plead as an excuse ignorance thereof, especially also as there may not perhaps be free access to all, unto whom our letter ought to be individually communicated; we will and ordain, that in the Vatican Basilica of the prince of the apostles, and in the Lateran Church, at the time when the multitude of the people is wont to assemble there to hear the divine service, it be publicly read in a loud voice by officers of our court, or by certain public notaries; and, after having been read, be affixed to the doors of the said churches, also to the gates of the apostolic Chancery, and to the usual place in the Campo di Fiore, where it shall for some time hang exposed to be read and seen by all; and, when removed thence, copies thereof shall still remain affixed in the same places. For we will that, by being thus read, published, and affixed, the letter aforesaid shall oblige and bind, after the interval of two months from the day of being published and affixed, all and each of those whom it includes, even as if it had been communicated and read to them in person. And we ordain and decree, that an unhesitating and undoubting faith be given to copies thereof written, or subscribed, by the hand of a public notary, and guaranteed by the seal of some ecclesiastic constituted in authority. Wherefore, let no one infringe this our letter of indiction, announcement, convocation, statute, decree, mandate, precept, and prayer, or with rash daring go contrary thereunto. But if any one shall presume to attempt this, let him know that he will incur the indignation of Almighty God, and of His blessed apostles Peter and Paul. Given at Rome, at Saint Peter's, in the year MDXLII of the Lord's Incarnation, on the eleventh of the calends of June, in the eighth year of our pontificate.